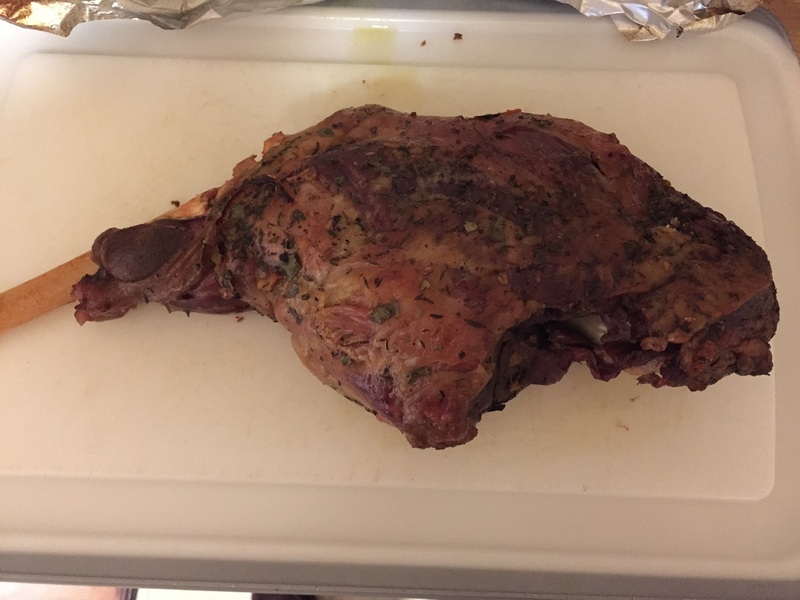 This is one of those times of the year where you can actually get a leg of lamb or a portion of a leg of lamb at a reasonable price so I usually try to get one to do something with it for a special weekend meal. 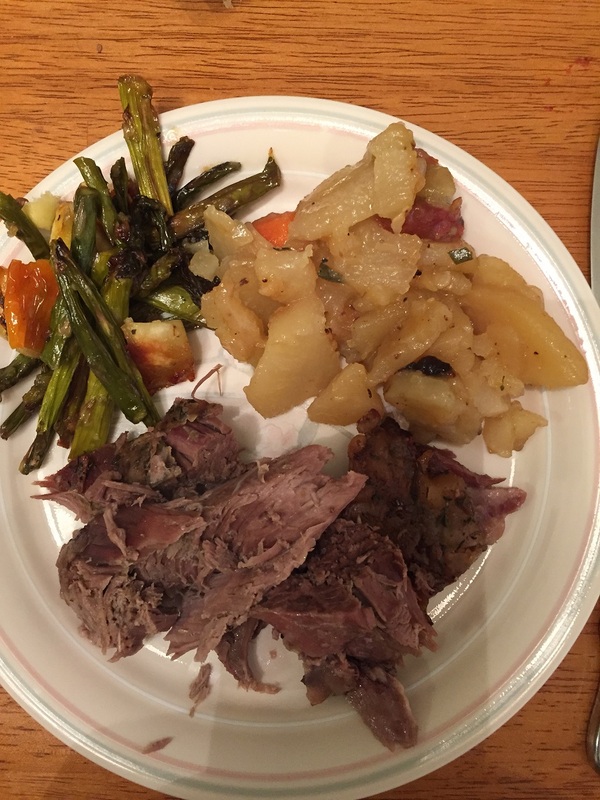 If you are intimidated by trying to cook a leg of lamb since it can be quite large and seem like it would be tough to cook, there are smaller portions you can get or even boneless legs that have been butterflied that may cost a little bit more but are easier to work with. this particular recipe that I cam across from Bon Appetit makes all of that difficulty go away for you. This slow-roasted leg of lamb leaves you with the easiest leg of lamb you will ever have to carve as it simply falls off the bone for you. it is easy to make and provides you with a really succulent meal. Preheat the oven to 350 degrees. Combine the garlic, thyme, and 2 tablespoons of kosher salt together in a small bowl. Using your fingertips, rub the mixture together until it resembles the texture of wet sand. Larger pieces of garlic will still remain. Set the mixture aside. Crush the bay leaves. Combine half of the potatoes with 1 tablespoon of the olive oil and 1 crushed bay leaf in a large roasting pan. Season the potatoes with salt and pepper and toss them well to coat them. Spread out the potatoes in a single layer in the bottom of the roasting pan. Place the leg of lamb on top of the potatoes and rub the lamb with the garlic mixture. Layer the tomatoes, onions, the remaining 3 crushed bay leaves and the remaining potatoes around and up the sides of the leg of lamb, seasoning them with salt and pepper and drizzling the remaining 6 tablespoons of olive oil as you go along. The lamb will be nearly covered. Add the white wine to the pan and cover the pan tightly with aluminum foil. Roast until the lamb is very tender, about 3 to 4 hours. Remove the foil and increase the oven temperature to 425 degrees. Roast, turning the lamb halfway through, until the lamb is golden, about 20 to 25 minutes longer. Let the lamb rest in the roasting pan for about 15 to 20 minutes. Pull the meat from the bones in large chunks. Discard the bones and any fat. Place the meat and the vegetables together on a large platter. Skim fat from the surface of the cooking juices in the pan. Spoon some of the cooking juices over the lamb and the vegetables and serve the remained alongside the lamb. I have to say that this may be the best lamb recipe I ever tried. The lamb easily fell off the bones and was almost like a pot roast or a pulled pork after it had been slow cooked. The braising it goes through in the oven is fantastic and the whole house smelled great while it was cooking, but the lamb itself had fantastic flavor even with just the simplest spice mixture of garlic, salt and thyme. The potatoes were fantastic as well and really added nicely to the dish. You certainly don’t have to worry about any carving of the lamb since it falls right apart for you and every agreed it was a great way to cook the lamb and one I will certainly try again.